Following a November pre-fall collection staged in Tokyo – which featured a robotic monolith towering at the catwalk’s centre by artist Hajime Sorayama and a laser-light show – Dior has released its Men’s Pre-Fall 2019 campaign. The Steven Meisel-lensed photographs follow in the same vein as the show: beams of light dart across the images, and a futuristic version of the Dior Men’s logo – as reimagined by Sorayama, who collaborated with artistic director Kim Jones on the collection – appears. 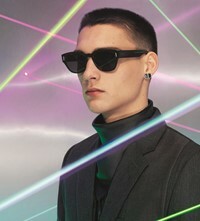 “I wanted the campaign to catch the energy of the Tokyo show, with the amazing laser lights of the finale,” says Jones. The designer’s first pre-fall collection for Dior was inspired by Japan, with prints reminiscent of the country’s famed sakura and Japanese tailoring (read about Jones’ long-standing obsession with Japan here, taken from the latest issue of Another Man). See more from the campaign in the gallery below.